The report forecasts the performance of the global uveitis treatment market across different geographical locations and critically assesses the opportunities of growth available for key stakeholders operating in the global uveitis treatment market. Primarily, the report highlights numerous developments that are likely to take place in the global uveitis treatment market in the years to come. Persistence Market Research analysts have judged the potential of the global uveitis treatment market and identified the drivers, restraints and trends that are likely to shape the destiny of the global uveitis treatment market within the assessment period. These elements of the market are likely to impact the long-term and short-term business strategies of companies working in the global uveitis treatment market. The report digs out the crucial factors that are anticipated to cement the base of the global uveitis treatment market. This market insight focuses on the market dynamics that are likely to impact the future and present of the global uveitis treatment market thereby providing useful insights to market players to plan their differentiating strategies capable of evolving with the changing market landscape. The report on the performance of the global uveitis treatment market for the period 2016 – 2024 begins with an overview of the market followed by key definitions and an executive summary that gives a 360o view of the revenue forecast of the global uveitis treatment market. The market taxonomy section dissects the global market into several key segments that are likely to play an important part in the evolution of the market in future. In the following section the report dives deep into the market and analyzes the key market dynamics likely to impact the expansion of the global uveitis treatment market. The report independently analyzes the various trends, restraints and drivers that will curate the fortune of the global uveitis treatment market over the next eight years. The last section of the report is devoted to study the market performance of some of the top companies operating in the global uveitis treatment market. The report profiles few of the leading market players and presents a detailed analysis of their overall business performance and a comprehensive evaluation of their short-term and long-term business and go-to-market strategies. This section is intended to provide report audiences with a dashboard view of the competitive landscape of the global uveitis treatment market. In depth secondary research has been used to determine the overall market size, top industry players, top products, industry associations, etc. Persistence Market Research has formulated a detailed discussion guide to conduct expert and industry interviews and the Persistence Market Research analyst team has interacted with multiple stakeholders to understand the present and future climate of the global uveitis treatment market. During the research process, the team has sliced and diced the accumulated data gathered through primary and secondary research and validated the same using the triangulation method and finally scrutinized the data using advanced tools to obtain qualitative and quantitative insights into the global uveitis treatment market. The global uveitis treatment market report encapsulates the key metrics that accurately describe the global uveitis treatment market and uses this data to compare market performance across the various segments and regions. Besides estimating the Compound Annual Growth Rate (CAGR) for the global and regional markets, the report analyzes the global uveitis treatment market on the basis of growth parameters such as Year-on-Year (Y-o-Y) growth to understand market predictability and to identify the right opportunities likely to emerge in the global uveitis treatment market. Further, the report studies the different market segments by conducting a Basis Point Share (BPS) analysis to understand the relative contribution of individual segments to overall market growth. This detailed level of information is important to identify the many key trends governing the global uveitis treatment market. Another notable feature of this report is an analysis of the revenue forecast of the global uveitis treatment market in terms of absolute dollar opportunity, which is critical in assessing the level of opportunity that market providers can look to achieve and also to identify potential resources in the global uveitis treatment market. Finally, the report dissects different market segments in terms of their growth and performance in the global uveitis treatment market and provides a market attractiveness index to help market players identify current and future market opportunities. Uveitis is considered to be the leading cause for blindness in the U.S. with a gradual rise in prevalence. Corticosteroid is deemed to be the first-line therapy for the treatment of uveitis. A significant number of compounds are lined in development for the treatment of uveitis. Leading market players are enhancing their product portfolio by adding new drugs. However, the process for the sterile formulations is highly challenging and companies are inclined to get aligned with the GMP and regulatory guidelines to manufacture their products. Newer drugs are in the offing and are expected to be introduced in late 2019. DE-109 (phase III) is in the pipeline and manufactured by Santen Pharmaceutical Co. Ltd. (sirolimus) for uveitis treatment. The drug is assigned as an orphan drug by the U.S. and European regulatory authorities for treating non-infectious posterior uveitis. 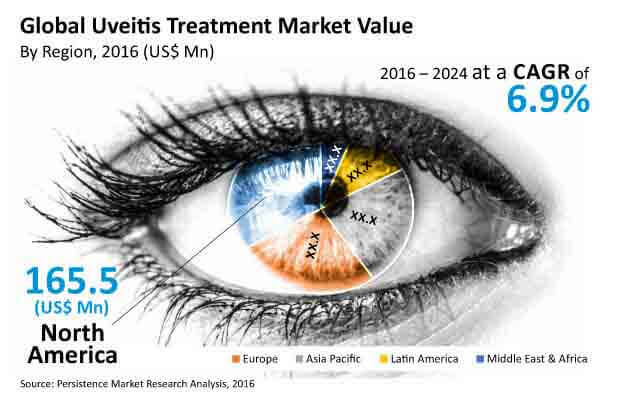 The global uveitis treatment market was valued at more than US$ 460 Mn in 2015 and was estimated to cross US$ 495 Mn by 2016 end, registering a Y-o-Y growth rate of 6.5%. The market is expected to reach beyond US$ 840 Mn by the end of 2024, reflecting a CAGR of 6.9% over the forecast period (2016–2024). North America and Europe are actively conducting clinical trials on uveitis. U.K and France are conducting more number of clinical trials in the Europe region. Countries such as India, Singapore, South Korea and China are gaining traction to conduct clinical trials for uveitis treatment owing to a large pool of the population suffering from uveitis in these countries. North America is the largest regional market in the global uveitis treatment market, which was estimated to represent more than 30% share of the total market in 2016 and is expected to expand at a CAGR of 7.3% over the forecast period. The APAC market is expected to expand at 6.7% CAGR over the forecast period and be valued close to US$ 194 Mn by 2024 end. By the end of 2024, the North America market is projected to surpass US$ 270 Mn. This region is expected to record a soaring absolute dollar opportunity by the end of the assessment period. The APAC market is anticipated to cross a market valuation of US$ 190 Mn and stay consistent till the end of the foreseen period, registering a CAGR of 6.7% between 2016 and 2024. U.S is expected to lay the foundation for the revenue growth of the North America uveitis treatment market. Market revenue of the U.S. in the North America uveitis treatment market is expected to grow 1.8x by 2024 end as compared to that in 2016. Canada will also contribute significantly to the expansion of the North America uveitis treatment market. The Canada market is projected to reach a market valuation in excess of US$ 50 Mn through 2024, expanding at a CAGR of 6.3% during the forecast period. Countries such as Japan, China, and India are expected to play a pivotal role in the revenue growth of the APAC uveitis treatment market. Japan is the largest market in the APAC uveitis treatment market, which represented more than 25% share of the total market in 2016 and is expected to expand at a CAGR of 6.8% over the forecast period. China is the fastest growing market, which is expected to grow beyond US$ 40 Mn over the forecast period. Revenue from the India market in the APAC uveitis treatment market is expected to grow 1.7x by 2024 end as compared to that in 2016.